BELFAST, Maine — To this day, locals debate whether the 1962 Route 1 bypass has blessed or cursed the town. Either way, it’s clear that tourists often stay on the highway and never visit the downtown as they head to such destination towns as Bar Harbor or Camden and Rockland. Business owners vying for tourist spending welcome any help they can get, though, and the city hopes to provide it in the form of directional signs. On Tuesday night, the City Council voted to spend $13,000 to get 15 signs made and installed that will help tourists find their way downtown. City Planner Wayne Marshall said Monday that the effort began nearly two years ago. 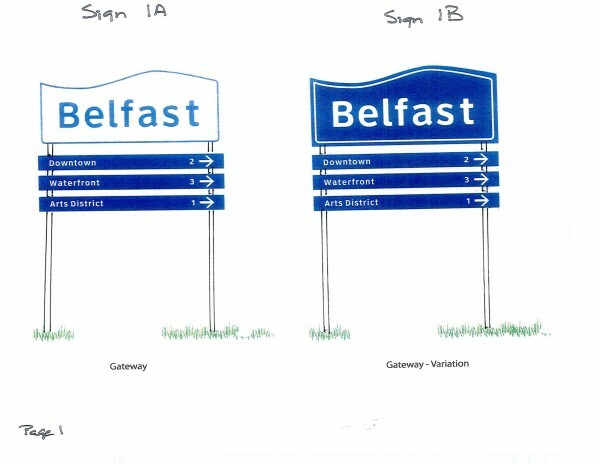 An earlier group of directional signs had fallen into disrepair and a committee that included Belfast Area Chamber of Commerce board members, the Our Town Belfast booster group and city staff began discussing new signs. During the discussion process, several ideas were considered, including having the signs help with “branding” the city. Earlier concepts also included more creative signs which some hoped would reflect the community’s artsy heritage. In the end, Marshall said, it was decided to keep the signs simple and functional. Four basic sign types were chosen and 15 different locations were selected, with three large signs planned to direct drivers off Route 1 south, west and east of the town. Marshall said one of the problems with earlier directional signs — such as the one south of town that now advertises “Historic Belfast” and promises “Easy off, Easy on,” aiming to ease drivers’ anxiety about finding their way back to Route 1 — is that once off the highway, there is no explanation of how far it is to find downtown. Travelers heading north on Northport Avenue may worry after driving for more than a half mile through a mostly residential section. Instead, the new signs would indicate just how far it is to the downtown, the harbor and the arts district. The larger signs will be designed to be read while people are traveling 50 mph, while the smaller signs are geared toward slower speeds. Councilors discussed having the signs be reflective, as per the recommendation of the Maine Department of Transportation. It would add to the cost of the signs but also would help travelers at night, Marshall said. Blue lettering on a white background or white lettering on a blue background are the color schemes being considered. Marshall told councilors that the Department of Transportation has endorsed the sign plan.